The principles of management are outlined in Information box 9.2 and Practical box 9.4. Obviously, treatment should be directed at the underlying disease. 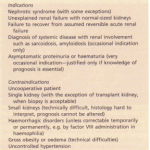 However, many causes of acute renal failure result in the ‘final common path’ of acute tubular necrosis. No treatment has been shown to affect the natural history of acute tubular necrosis. Clearly as many of the factors leading to hypoperfusion should be controlled as quickly as possible. Often this requires fluid replacement, guided by measurements of central venous pressure or pulmonary capillary wedge pressure. The polyuric phase of acute tubular necrosis requires extremely careful clinical care in order to avoid further renal injury from hypovolaemia. Inotropic support is rational treatment in patients with cardiac disease and poor renal perfusion; low-dose dopamine selectively improves renal perfusion. 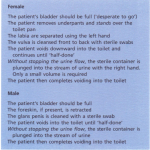 The role of loop diuretics and mannitol remain controversial. Theoretically these agents may help to flush out tubular debris, prevent reflex vasoconstriction in response to tubular injury, and decrease renal work and oxygen consumption. 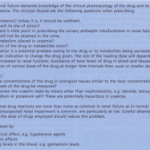 Controlled trials have shown that loop diuretics in very high doses may increase urine volumes in acute tubular necrosis without much effect on GFR or the subsequent need for dialysis. This marginal benefit must be weighed against the risk of exacerbating hypovolaemia if they are used without adequate monitoring, the risk of auditory toxicity, and (with mannitol) the risk of causing volume expansion and pulmonary oedema if an adequate diuresis is not achieved. Acute renal failure can be treated by dialysis. Particular care should be used to avoid haemodynamic disturbance and because of this continuous haemofiltration, haemodialysis or peritoneal dialysis are often preferred to intermittent haemodialysis, particularly in patients with persistent cardiovascular instability. The underlying cause of renal disease should be treated aggressively wherever possible, e.g. tight metabolic control in diabetes. Antihypertensive treatment is thought to decrease the rate of deterioration of renal function in chronic progressive renal disease, whatever the initiating cause. Blood pressure should probably be reduced to around 140/80 mmHg. Captopril (an ACE inhibitor) has been proven to slow the rate of deterioration in GFR in diabetic nephropathy to a greater extent than with other hypotensive agents inducing the same degree of blood pressure reduction. ACE inhibitors are under investigation for other renal disease but are now the drugs of choice for hypotensive therapy. ACE inhibitors must be used with caution in the presence of coexistent renal vascular disease. Adequate blood pressure control may require a combination of drugs together with large doses of diuretics to correct sodium and water retention. In patients receiving regular dialysis blood pressure can often be controlled by removal of sodium and water during dialysis. Hyperkalaemia often responds to dietary restriction of potassium intake. 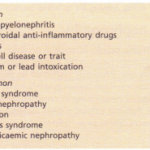 Drugs which cause potassium retention should be stopped. 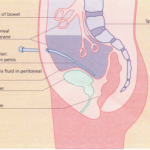 Occasionally it may be necessary to presribe ion-exchange resins to remove potassium in the gastrointestinal tract. Correction of acidosis helps to correct hyperkalaemia in chronic renal failure, and may also decrease muscle catabolism. Sodium bicarbonate supplements are often effective, but may cause oedema and hypertension due to extracellular fluid expansion. Calcium carbonate, also used as a calcium supplement and phosphate binder, also has a beneficial effect on acidosis. Hypocalcaemia and hyperphosphataemia should be aggressively treated, preferably with regular (e.g. 3- monthly) measurements of serum PTH to assess how effectively hyperparathyroidism is being suppressed. Dietary restriction of phosphorus is seldom effective alone, because so many important foods contain it. Oral calcium carbonate acts as a calcium supplement and also reduces bioavailability of dietary phosphorus. la-Cholecalciferol and 1,25-(OH)2D3 increase calcium absorption and also directly suppress parathyroid activity, but must be used with great caution to avoid hypercalcaemia. They have the disadvantage that they also increase phosphorus absorption and may therefore exacerbate hyperphosphataemia. H2 antagonists decrease the effectiveness of phosphate binders. In advanced renal disease, reduction of protein intake lessens the amount of nitrogenous waste products generated, and this may delay the onset of symptomatic uraemia. There is some evidence to suggest that dietary protein restriction may slow the rate of progression towards end-stage disease but this remains controversial. A high fluid intake is probably beneficial in chronic renalfailure, allowing excretion of metabolites despite poor concentrating ability, and suppressing vasopressin (which may contribute to progressive renal disease). Fluid restriction is sometimes necessary in patients with oedema, but is less important than sodium restriction. The treatment of lipid abnormalities in chronic renal failure is controversial. Reducing excessive dietary fat intake is sensible. Many lipid-lowering drugs are unsafe in renal failure. The anaemia of erythropoietin deficiency can be treated with synthetic (recombinant) human erythropoietin, starting at a dose of 25-50 U kg” three times a week; subcutaneous administration is more effective than intravenous. Blood pressure, haemoglobin concentration and reticulocyte count are measured every 2 weeks and the dose adjusted to maintain a target haemoglobin of 10-l2 g dl”. Failure to respond to 300 U kg” weekly, or a fall in haemoglobin after a satisfactory response, may be due to iron deficiency, bleeding, malignancy or infection. Partial correction of anaemia with erythropoietin has been clearly shown to improve quality of life, exercise tolerance, sexual function and cognitive function in dialysis patients, and to result in regression of left ventricular hypertrophy. Avoidance of blood transfusion also lessens the chance of sensitization to HLA antigens, which may otherwise be a barrier to successful renal transplantation. The disadvantages of erythropoietin therapy are that it is expensive and causes a rise in blood pressure in up to 30% of patients, particularly in the first 6 months. Peripheral resistance rises in all patients, due to loss of hypoxic vasodilatation and to increased blood viscosity. A rare complication is encephalopathy with fits, transient cortical blindness and hypertension. Other causes of anaemia should be looked for and treated appropriately.